The network of neurons in our brains somehow grants us the conscious ability to learn and grow, so the pattern itself is self-optimizing. As I discussed in the previous post, its branching structure – what I refer to as the Constructal Pattern – also seems to be a structural feature of the universe. How can a pattern produce life? The intelligence that emerges from the Constructal Pattern has the ability to learn from (and adapt to) its environment. To understand consciousness, we need to understand how this works – how complex behavior can emerge from the behavior of networks — which is essentially the purpose of Obama’s BRAIN Initiative, a scientific endeavor to research how we “think, learn, and remember”. We may find answers to these questions and more hidden within the branches of the Constructal Pattern. As I describe in other posts, consciousness is emergent, meaning that it amounts to more than the sum of its parts. Consciousness may be rooted in physical networks (i.e. the Constructal Pattern), but to say that it is only a physical network is to neglect its emergent properties. (Consciousness does not “physically” exist.) Still, the idea of such a simple pattern coming to life is breathtaking. The Constructal Law essentially describes a universe where complex life can can emerge from nature’s tendency to form patterns, as demonstrated by simulations like Conway’s Game of Life. The Constructal Pattern is essentially the fingerprint of life – and it’s found everywhere, ranging from the microscopic to the unfathomably large. 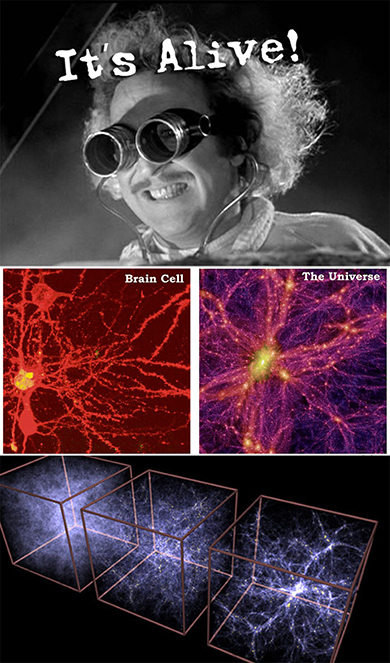 To return to a question I raised earlier, does this make the universe a giant, self-optimizing neural net? Matter forms networks. Networks form patterns. Patterns spawn consciousness. Nature improves with time. Powered by the forces of natural selection, natural systems always deviate towards improved flow (better efficiency, survivability, resilience, so on). This means the best natural designs flourish, whereas outdated or less efficient designs dwindle with time. This also implies that evolution favors intelligent life, precisely because of its ability to reconfigure. Life’s ability to make intelligent decisions is what grants its resilience. All matter is subject to the forces of entropy. But whereas lifeless matter inevitably decays, something about the structure of this network enables it to spontaneously adapt to its surroundings, which grants it persistence over time (life). In a sense, the Constructal Pattern is nature’s solution to entropy. The concept of natural selection is paralleled in technology as recursive self-improvement. Both natural and artificial systems improve: Nature does it through evolution, and technology does it through the process of iterative design. However, the latter process must be consciously guided – but as I will now suggest, these are merely two ends of an endless cycle of nature creating technology, then technology emulating nature because it’s such a great technology. Nature produces intelligence. Matter is subject to the laws of physics, and over long periods of time – and after many random particle interactions – meaningful patterns begin to take shape. As the laws of physics continue to shape matter into the Constructal Pattern, consciousness is the inevitable result. Intelligence produces technology. The intelligent life that emerges has the ability to make new technologies that further accelerate its growth. New technologies improve upon those of the past, which contributes to a second derivative of growth. Intelligence recreates nature. We know that technology becomes more efficient with time. Beyond a certain threshold, that process of iterative refinement becomes unguided (i.e. automatic). Eventually, technology will gain the ability to improve on its own; a postulated event known as the Singularity. At this point, new designs become self-improving without the need for a designer, essentially recreating the conditions of Step 1 (‘unattended’, or natural optimization). Yet, to accomplish this, we must look back to the origins of our own consciousness (i.e. the Constructal Pattern) and replicate the same designs. So in a sense, this makes the Constructal Pattern the answer to its own question: We rely on nature (the brain and its pattern of neurons) in order to build what we consider to be a highly advanced technology (AI). In essence, we use technology to recreate nature. The term “singularity” is borrowed from mathematics, but in this context, it means the emergence of intelligence from a network; or in a general sense, when something becomes more than the sum of its individual parts. While on the subject, here is a great article written by The Next Web on the Singularity, and here is an article from KurzweilAI written on The Law of Accelerating Returns. I also write on the exponential growth of technology and Moore’s Law in the Exponential Series. The Singularity isn’t about technology. It’s about networks – biological and digital the same. Because natural networks already demonstrate many key aspects of the Technological Singularity (conscious, self-improving, massively parallel), nature can be understood as a fully manifested Technological Singularity in its own right. In other words, the universe we live in is a self-improving technology because of the Constructal Pattern it has spawned; a network that can live, learn, and adapt to its environment. The self-improving technology we seek to create already surrounds us. If the Singularity means self-improving technology – and if we view nature as a self-improving system – then at least one Singularity has already occurred, and we exist within it.Therefore, I think we need to reframe our understanding of the Technological Singularity and what it means. Rather than being a purely “technological” event, I expect the Singularity to be a time of rapid convergence between nature and technology – a time when human technology fully optimizes itself for its environment (i.e. the laws of physics) – which implies mimicking the Constructal Pattern, a natural phenomenon.In other words, we need to correct the notion that the Singularity represents the separation of technology from the natural world. In fact, it represents an even closer union. This pattern is also referred to as the mycelial archetype, the cosmic web, or the cosmic filamentary structure. Its origins are discussed more in the first part. If we are surrounded by an unseen fabric of what appear to be neurons, we may have a rational basis for the “living universe” argument. Terminology gets a bit arbitrary here. Since the Constructal Pattern is natural, if we replicate the same pattern to build AI, then the consciousness that results isn’t “artificial” (having emerged from a natural pattern). This essentially means there is no such thing as “artificial” intelligence; only general intelligence. In other words, once we get it right, there will be no such thing as “artificial” intelligence. This begs the question; what defines technological complexity? Because we have so much to learn from the brain, it is in many ways a superior technology to anything we have today. This cycle does not necessarily repeat. Perhaps the fate of intelligent life in the universe is to merge with technology and enter a new state of being that we cannot fully comprehend. To restate (and to borrow a quote from the previous post), technology improves through the process of iterative design, which implies a perpetual improvement in efficiency (i.e. more work per unit energy). As technology improves, it becomes more like nature, because natural flow is optimally efficient. Thus, intelligence uses technology to recreate its origins (nature; the Constructal Pattern). 2020 is the most popular prediction for when this might happen. Today we have machine learning algorithms that can be optimized for specific uses, but aside from specialized applications, self-improving technology is outside the scope of our abilities. In other words: The Singularity has already happened, and now it’s ours to recreate based on the blueprint we’ve found in nature. If the constructal pattern represents the best optimization given the laws of physics we experience, then as technology becomes more efficient with time, its design will approach the same pattern. Brent Peters attends the University of California, Santa Cruz, where he is a fellow of the Global Information Internship Program (now the Everett Program), which is an organization that focuses on bridging the digital divide through projects that empower communities with Information and Communications Technology. 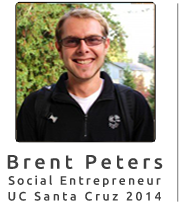 He will graduate in 2014 with a degree in Global Information and Social Enterprise Studies (ICT/Sociology). Universality geometries may hold the answer to awareness and self-observation, since they certainly seem to for self-organisation and emergence. I like your observation that we already are involved in a grand experiment of developing systems with intelligence producing suitable systems for improved life. But as a person with Native American roots, I think we have two types of consciousness at work: the egocentric and the holistic (see Lakoff’s WHERE MATHEMATICS COMES FROM). I believe that undirected or egocentric guided technology will spell death to humanity, esp if it is not balanced by the requirement that any technology that compromises the longterm wellbeing of the whole planet must be tossed on the scrap heap–even if it is momentarily profitable. Do you see any evidence that this sort of awareness is surfacing in our collective consciousness? Yes, I’m hopeful. And I do see what you mean. I’m writing a series on cosmopolitanism and on the need for species unity. Also along similar lines is the Human Project (www.humanproject.us), which I want to eventually help expand into a discussion community and combine with http://spectrum.brentpeters.me, as a means of uniting competing ideals. As Carl Sagan said, any organism at war with itself is doomed, and if we want to stay around for a while (in a planetary sense), we need to focus on the big picture – things that affect us all – not just state interests. Personally, I see that as uniting technology and nature (not simply build technology at nature’s expense) – that is, uniting the ideals of the ego and the holistic framework you mention. It’s also a social effort. Everyone wants to live, but the tragedy of the commons often gets in the way – i.e. greed – a byproduct of ego. I will check out Lakoff’s paper. Funny you should mention, I tried e-mailing him several months ago… he never got back to me. But I will give that a read, it sounds interesting. Nanotechnology + synthetic biology creates plants capable of supercharged energy production or as sensors for explosives.